Reggie swimming at one of his favourite spots, Kil-Cona Dog Park in Winnipeg. The first time I met Reggie was on my birthday in 2005. 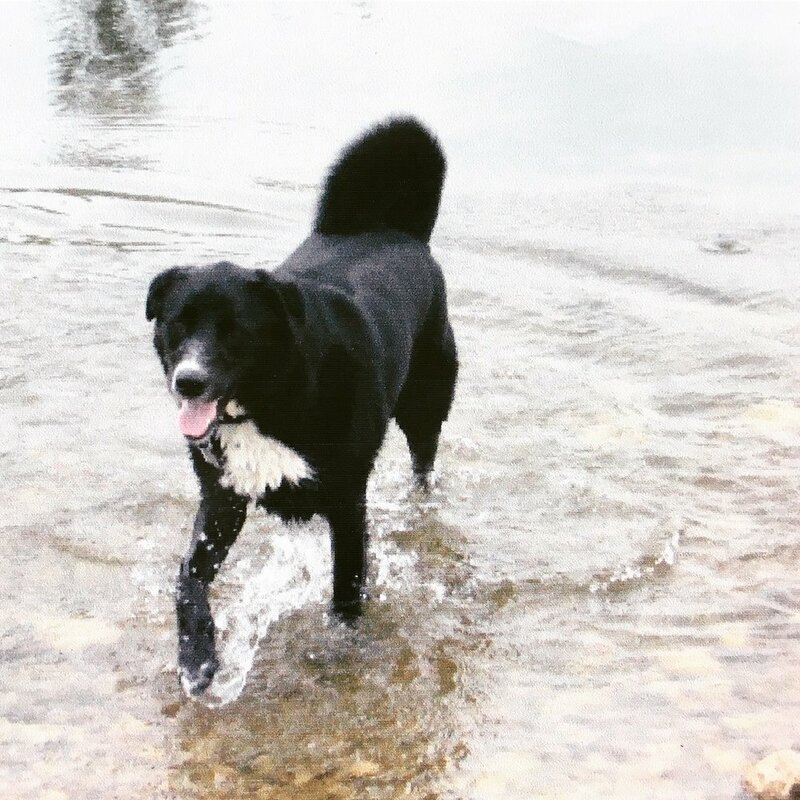 A week prior I had lost my first childhood pet, a border collie named Pepper, and was visiting a local no-kill shelter to spend an hour or so playing and interacting with the dogs as a sort of therapy for dealing with my loss. It was, theoretically, supposed to end there. But of course it didn't. As soon as I saw the little lab-cross in his cage, looking longingly at me with his puppy-dog eyes, seemingly imploring me to rescue him, I simply had to. He found a home and I found a faithful friend that would bring joy and companionship to my life for years to come. Over time, Reggie became somewhat of a legend in my neighbourhood. He grew into a big dog–just two years ago, he weighed in at 95lbs at the vet–and had an intimidating look about him, exacerbated by a grizzly bear-type hump on his back. This was all a facade though. Black dogs, as studies show, are perceived as being more "aggressive" than other colours of canines. In actuality, Reggie was a big softie. He was a ham who loved attention while out on his walks. We went everywhere together. During this time, I operated a home-based design business and taking him out for his daily strolls became part of my creative process, forcing me from my desk and allowing my mind to flourish with new stimuli. Upon reflection, these moments provided some of my fondest memories. The time I spent with him in virtual solitude on our hikes, admiring the simplicity of nature and complexity of life, instilled a deep appreciation for exploration that I might not otherwise have. As friend, as companion, this animal helped me grow. I wasn't able to have a large dog in my apartment when I moved cities in 2010 and so my parents took on Reg. My father started calling him "Bone" to the point where people had forgotten his given name (he was named after the Reggie character in Archie comics for his raven black hair). As my father entered retirement, he and "Bone" developed a deep bond that was only broken when my father died from esophageal cancer in 2014. Prior to his passing, he confided in me that the dog had saved his life, jumping on his chest as he lay in bed one morning struggling to breathe. He felt no one would believe it but I did. I, myself, can attest to the strange behaviour of Reg/Bone just a few hours after my father was gone. He knew. Somehow, he knew. The last time I saw Reggie was in April. I was visiting my mom in Winnipeg and she had some concerns about him. At the time, I felt he appeared okay. His vision and hearing had long been in decline but at the age of thirteen, which is eighty-two in dog years, it was to be expected. And even though he struggled a bit while walking, I felt he was still alert enough that we probably had a few months left. Perhaps Autumn would be the time to make that difficult decision that every pet owner fears. Reggie, one of the best good boys on the planet, passed away on May 29. I am very saddened that I didn't get to say goodbye to this wonderful soul that has been a constant presence in my life through a very transitional era. He will forever be loved and hold a place in my heart. The last photo of Reggie and I, Winnipeg, April 2018.